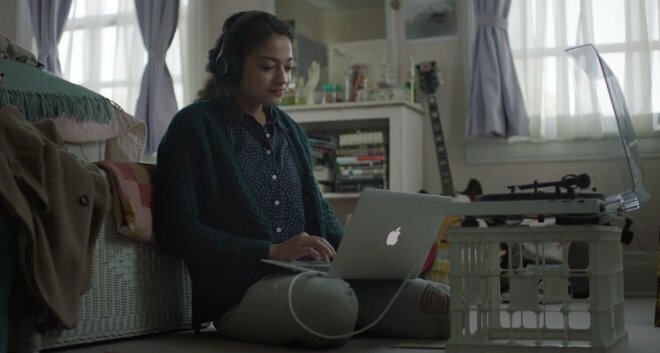 Following the weekend release of its tearjerker holiday ad featuring a girl who records a duet with a discovered vinyl recording by her grandmother, Apple has posted a video showing the technology behind both recordings. Apple's original ad, named "the Song," implies that the grandmother recorded a song for her husband in the military. A follow up video Apple posted to its YouTube account (embedded below) serves as a mini-documentary of "Voice-o-Graph" recording booths from the 1940s that let people record their own voice to a record, complete with a stamped envelope for mailing the recording as an audio postcard. The original ad was filmed with the help of Third Man Records, which maintains an original recording booth from the WWII era. The video also presents the granddaughter as being a musician who regularly uses Garage Band, Apple's music recording and editing software that's now bundled for free with new iPhones, iPads and Macs. The original ad was published with a description reading, "With a Mac, iPhone or iPad you have the power to create thoughtful, emotional gifts and memories that transcend time. It could be a movie, a homemade card or a song that brings two generations closer together."